The San Francisco 49ers have a big home game coming up this week against Seattle (4:25 p.m. ET on FOX), and the team is going to go out of its way to make sure the crowd at Candlestick is ready for the league-leading Seahawks’ visit to the Bay. How are they doing that, you ask? Well, on Wednesday, the team reportedly sent fans "The 49ers Home Field Advantage Plan for Gameday," a three-step guide telling fans how to give the 49ers a leg up on the field. Because every fan needs to be reminded how to cheer for their own team, I guess. 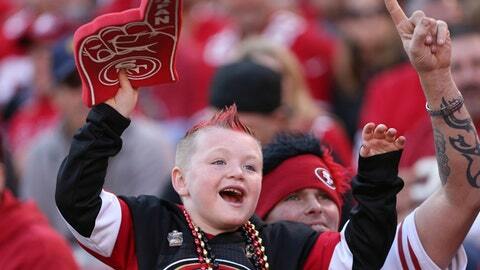 Step 1 encourages fans to wear 49ers gear, which is always a necessary reminder. I can’t tell you how many times I’ve seen fans accidentally show up to root on the 49ers wearing another team’s jersey. Thanks to this tip, Phil from Petaluma will have no excuse this week if he mistakenly puts on his Richard Sherman jersey instead of his Frank Gore when he leaves for the stadium. Step 2 informs the 49ers faithful that they should be on time for the game. With Niners seats going for an average of $216 a pop, it should kind of go without saying that fans should want to maximize the value of their ticket. But if a "proper greeting" will help Patrick Willis stop Seattle’s offense, then I suppose it’s worth the reminder. Finally, Step 3 reminds fans that, while cheering is cool, cheering all the time is not so cool, so pipe down when the home team — that’s the one in the red, the color you’re supposed to be wearing, remember? — is at the line of scrimmage. This one shouldn’t be a problem to implement, mostly because 49ers fans have already complained about crowd noise, comparing Seattle’s to PEDs. No upstanding Niners fan would want to bring similar shame upon their own team. Honestly, this all seems a little unnecessary and, really, insulting to 49ers fans who already know how to cheer for football. (It’s really not that complicated.) But, in this day and age, you can never be too careful — and with a favored Seattle team that’s used to record-setting crowds coming to town, a little pep talk couldn’t hurt. Now, go work on your "Ahhh-Oooo" call so you don’t screw it up on Sunday. • Speaking of Sunday’s game, a Seahawks fan group plans to fly a banner over the stadium during the team’s game at San Francisco this week. • Texas Tech coach Kliff Kingsbury dished to Esquire about his impeccable fashion sense. • Brett Favre will be coaching for a championship this weekend. • Rob Ford is going to have a weekly radio gig in DC. • When the Lions and Falcons play in London next season, the game will kick off at 9:30 a.m. ET. • Howard Schnellenberger says Nick Saban "needed a big serving of humility" and got it against Auburn. • Prosecutors say Aaron Hernandez’s girlfriend lied 29 times to a Bristol grand jury. • Deion Sanders was fired from his own academy — again. • A Louisville women’s basketball player collapsed and had a seizure on the bench during a game Tuesday night. • Notre Dame cornerback Lo Wood is transferring, and UCF and Georgia Tech are on his radar.